As I say goodbye to 2013, I need to take a moment to reflect on a year that brought so much happiness and growth to my life, both personally and professionally. Nick and I celebrated our third anniversary in October – and we continue to learn new things about each other and grow together every day. I’ve continued to blog (although admittedly with less regularity than I’d like), and I’m writing creatively as well, which thrills and challenges me. I’ve established my role and found my pace in a job I enjoy (most days). And I’ve learned more about myself this year, I believe, than any year prior. The closing months of 2013 have also brought big changes to our lives – in these first months of 2014, Nick and I will be moving further south, to Georgia, to explore a career opportunity for him as well as a new city and lifestyle. And so this Maine girl ventures even further from her roots. I look forward with enthusiasm to what 2014 will hold for us. I hope it’s at least one European vacation (? )… in addition to continued happiness and growth in our personal and professional lives. It would be lucky indeed to see the positive momentum from 2013 carry through into 2014. 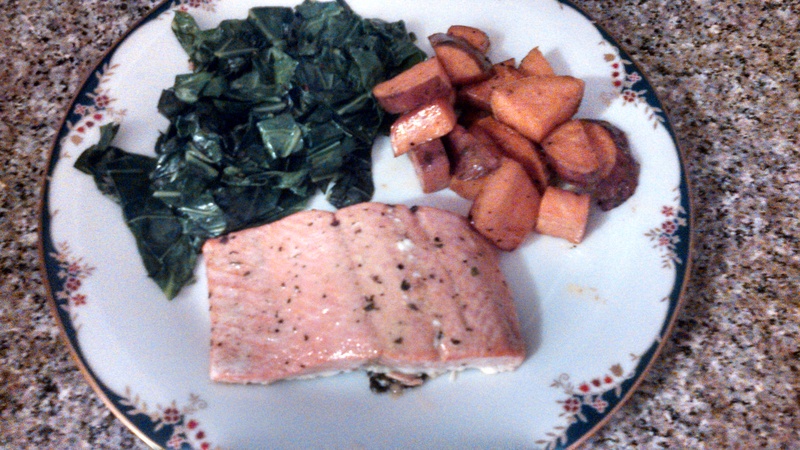 With that in mind, I put together a modified, “lucky” New Year’s Day meal featuring salmon, collard greens, and roasted sweet potato. It’s a healthy blending of foods from my Northern roots and Nick’s Southern ones. Many New Englanders eat fish on New Year’s Day (shocker…), and I chose Alaskan salmon to reflect the courage and stamina of the fish themselves – as they battle against the current every year to spawn. Collard greens are a traditional Southern New Year’s dish – they are green, reflecting (you guessed it) dollar bills. As for the sweet potato, I must admit it has no symbolism that I’m aware of – but we had some, they’re good for you, and Nick loves them. Need there be another reason? Our ‘good luck’ meal certainly tasted great! Categories: Eat, Holidays | Tags: 2014, changes, Happy New Year, Maine, meals | Permalink.